This is a picture of our beautiful daughter, Shantel. For those of you that may not know, Shantel had cancer in both eyes and had to have both eyes removed when she was two years old, leaving her blind for life. Bill and I spent our lives helping Shantel accept her blindness, and learn to live blind in a sighted world. The beautiful smile you see on her face has never faded throughout all the years of challenges she faced and overcame. I never saw Shantel spend one minute complaining, or feeling sorry for herself, and she never wanted anyone else to feel sorry for her either. Bill and I fought long and hard to ensure Shantel had everything she needed to get through her school years from Kindergarten through earning two degrees in College. 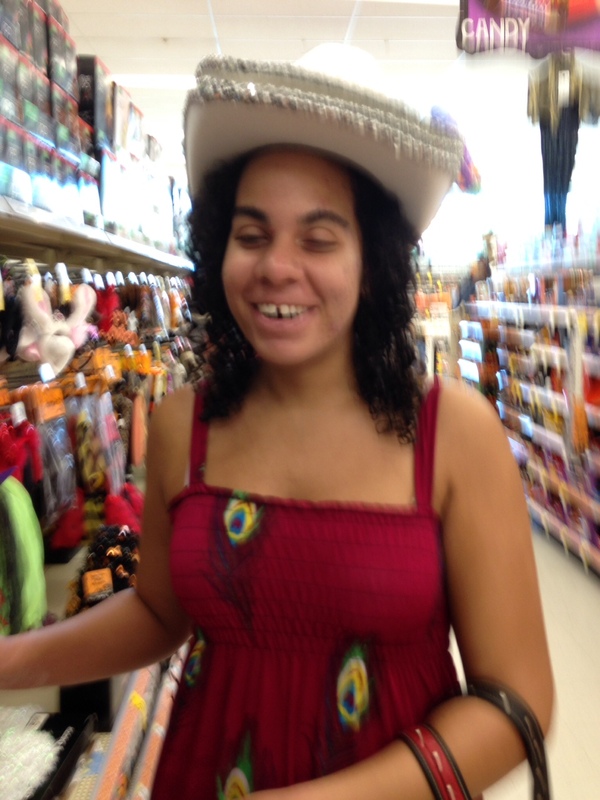 We had to attend endless Individual Educational Plan (IEP) meetings, to get everyone on board with what would be expected of Shantel in the classroom, as well as what would be expected of the teacher, and the support team hired to braille Shantel’s books, worksheets, test papers, etc. All this was done to ensure Shantel’s rights were upheld in the classroom so she had a fair and level playing field to compete with her peers. I can tell you nothing we fought for, and won, to support her needs came easy, but neither Shantel, or Bill and I would ever give up. Finally, after months and months of searching, Shantel signed on with a temp staffing agency. The temp agency was able to get her a seasonal job in a call center not far from where she lives. 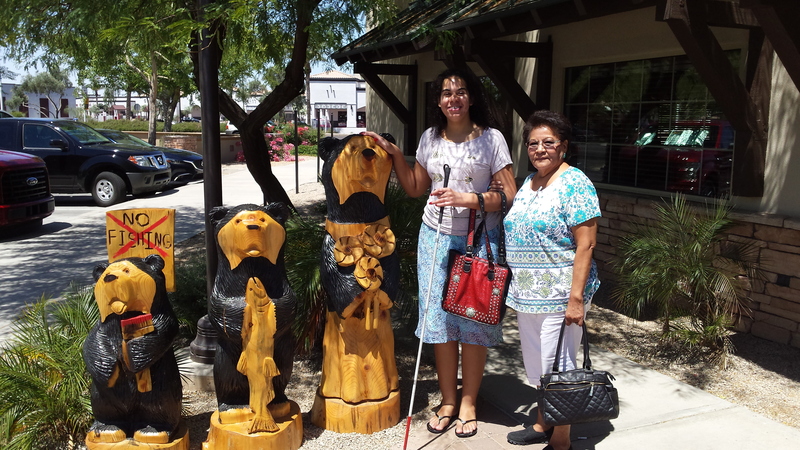 Both the temp agency and the call center company know she is blind and agreed they could accommodate her needs with the voice over software. She is earning $14.00 an hour even as she goes through a six-week training class. Shantel was overjoyed to say the least. Of course she will need to give up her Social Security and food allotment benefits while she is working but she can have it reinstated if she gets laid off. She doesn’t even mind the fact that the training classes are from 4:00 p.m. till midnight which means she has to pay for a cab to take her home every night because Dail-a-Ride stops running at 10:00 p.m. 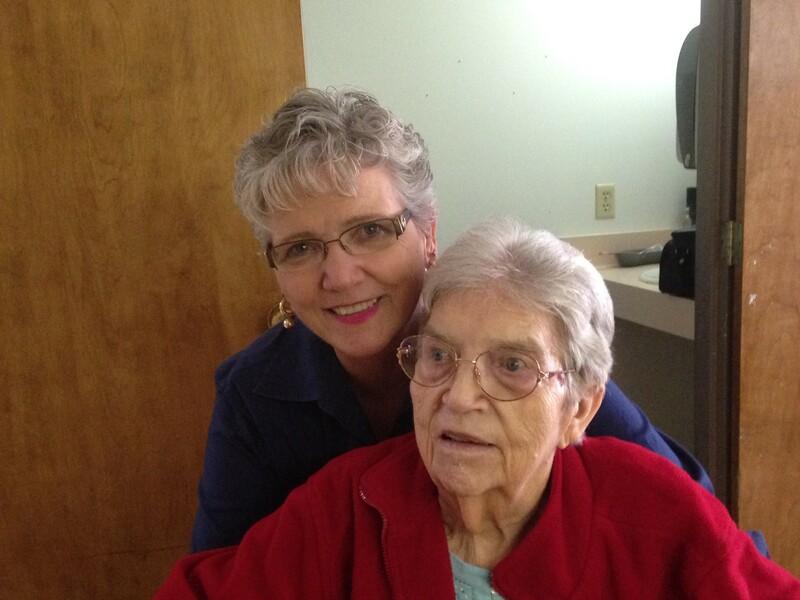 I can tell you I pray her home every night because I’m so worried about her being out all alone at that time of night. Bill and I live over an hour and a half from Shantel or I would go pick her up and take her home myself. 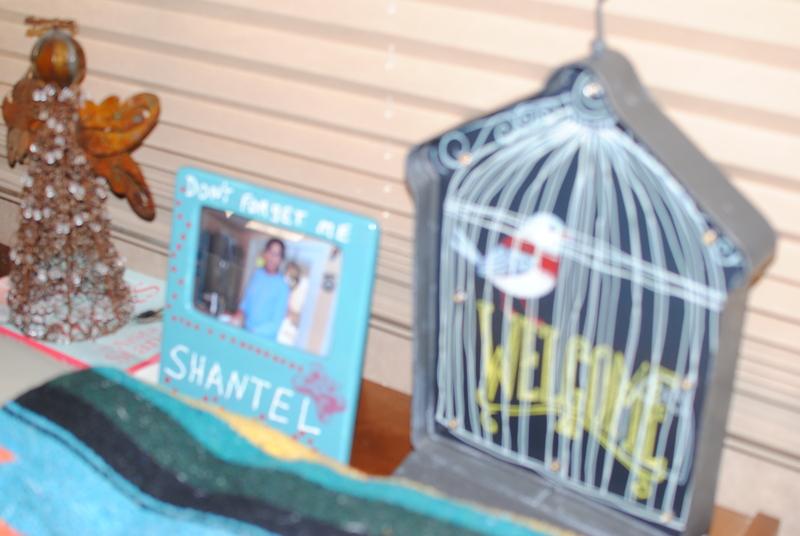 When Shantel’s training class started, the very first thing she was told was that they did not have the voice over software installed on the computer she needs to use for training. They said it has been ordered but has not arrived yet. This is NOT good at all. Shantel cannot learn, and keep up with the class if she doesn’t have that software on her computer. The instructor told her to “just sit and listen and do the best she can to keep up… ” That is exactly the type of thing Bill and I had to fight the school system about when Shantel was still in school…. Promises made that were not kept and Shantel was the one that paid the price. As her mother, it just sends me over the top because it’s just not right! I talked to Shantel yesterday, and she told me “mom, you’re not going to believe what happened last night at work.” I asked what happened, and she told me that the voice over software has arrived but now the ITD department said they are not going to install it twice which means they will not install it on the training class computer, only the production floor computer she will use once she completes her training.” Then she went on to say the training instructor said Shantel needs to repeat the six-week training class because if she goes out on the training floor at this point she will not be able to handle the call volume because she has not had a computer to practice on… Are you kidding me!! How is another six-week training class going to benefit Shantel if ITD won’t put the voice over software on the training class computer? I told Shantel to get a meeting with the training instructor and her supervisor/manager and the production floor supervisor/manager and ask if she can have someone on the production floor give her one-on-one training on the computer she will be using that has the voice over installed in it… I don’t know why, after all these years, it still amazes me that people that are managing companies, and people, can be so lacking in common sense!! I asked Shantel if she thinks all she is going through to have this temporary job is worth it? Shantel said “mom, 70% of blind people never get a job, I’m going to be in the 30% of the blind people that do get a job. I don’t want to live on Social Security and food allotments, I want to be financially independent, and this job at least is paying me $14.00 an hour, and I’m hoping it just might work into a full-time position. But if not, at least I’m gaining more work experience…” My heart bursts with pride for her. Papa and I love you Shantel, we are so VERY proud of you. You face more challenges in one day than many people face in a lifetime, and you never give up! YOU are our HERO!!! As most of you know, Bill and I planned to be at McDowell Mountain Regional Park in Fountain Hills Arizona for the winter. 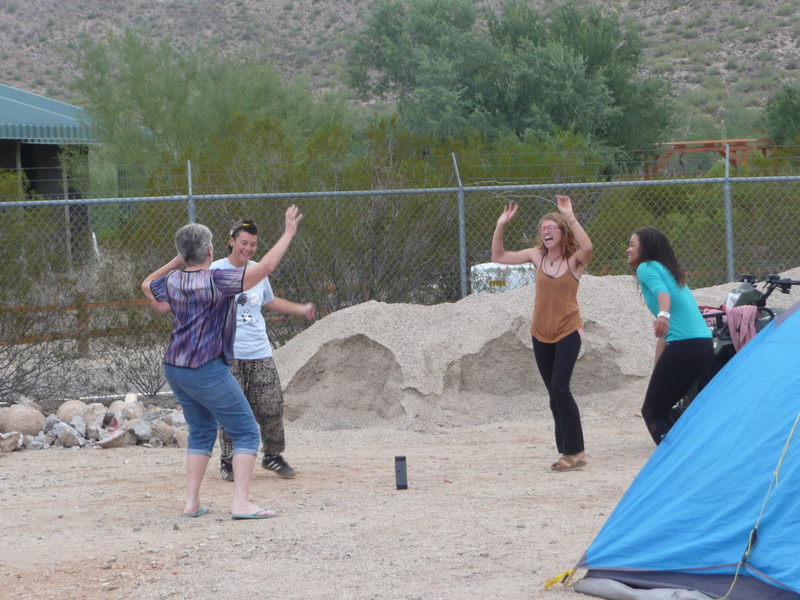 We actually spent two days there before we were asked to come back to San Tan Mountain Regional Park in Queen Creek Arizona for a few weeks to help out because they were left short-handed after a couple of full-time staff members left. We were happy to come and do whatever we could to help out. However, now we have been given the word that we are needed back at McDowell Mountain so we are busy pack things up and getting our rig ready to move out and head back to McDowell on Sunday 10/30. 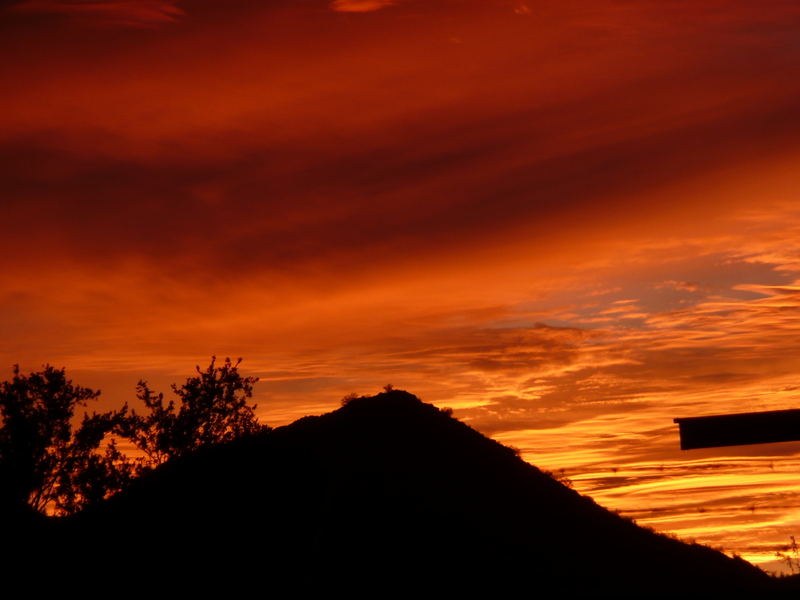 Bill and I enjoyed the time we spent at San Tan last winter, and San Tan will always hold a special place in our hearts. 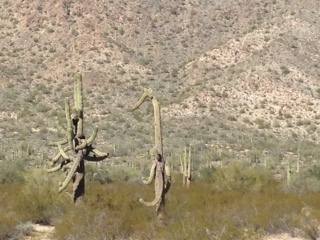 San Tan is a beautiful day use park with unique cactus formations like the one in the picture below. It always reminds me of a Sea Horse. 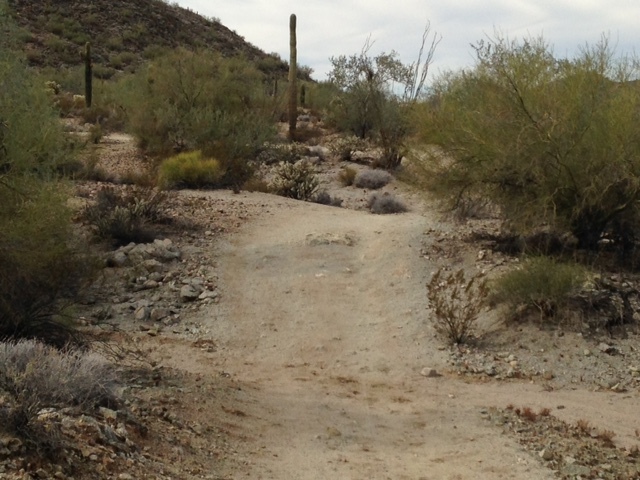 San Tan has beautiful hiking, mountain biking, and horseback riding trails. And some of the most beautiful sunsets I’ve ever seen. 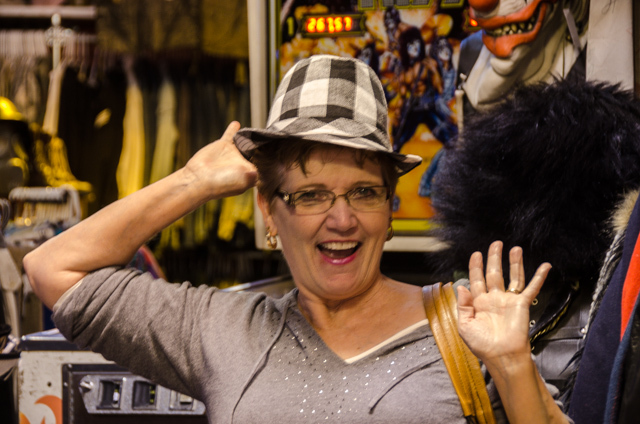 It’s been a year of fun and exciting travel for Bill and I, but it has also been a year of heartache and loss. I lost my mother this past March. 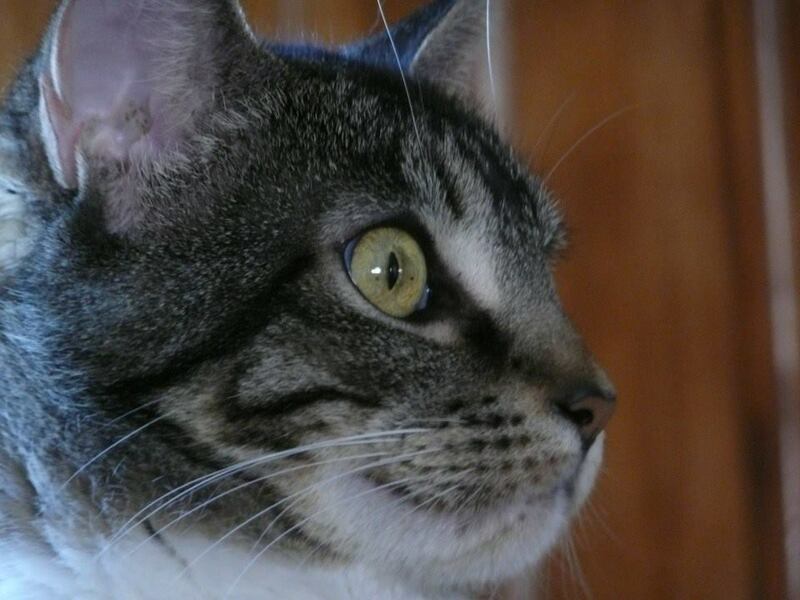 And then, just a few weeks ago, we lost our beloved cat, Carmen. Death is part of the circle of life, and it’s a hard fact of life… But I believe loving also means letting go when it’s time, knowing there is more to life than what we experience here. Now, I’m ready to turn my thoughts to another new beginning, and looking forward to making new memories at McDowell Mountain Regional Park. I’m excited to meet our co-hosts there and all the visitors that will come to enjoy that Park. 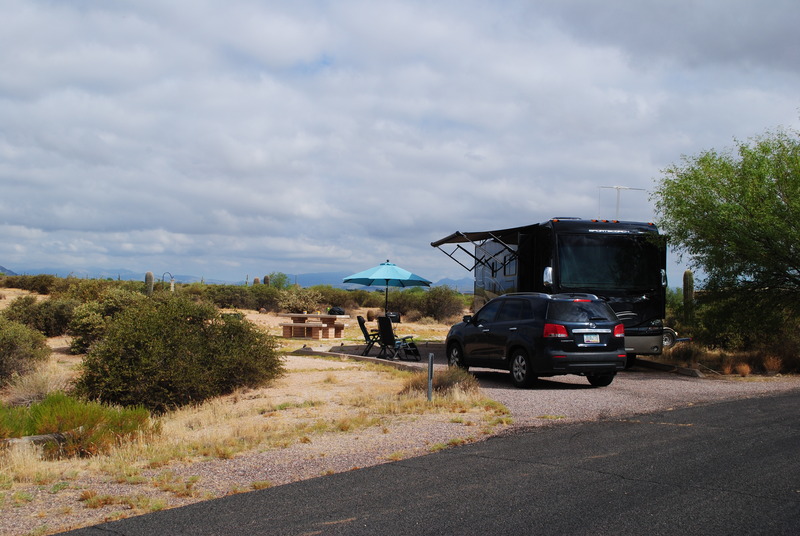 McDowell Park is three times the size of San Tan and not only offers over 65 miles of hiking, mountain biking, and horseback riding trails…,but it also offers camping sites for visitors to enjoy… The picture below is our campsite at McDowell. While Bill and I were working one of our shifts in the Fee Booth/Nature Center at San Tan Mountain Regional Park this week, I encountered a woman who became my 1% of the public that came in pissed off, and wanted to spew her hate and discontent on the first person she came in contact with, which just happened to be “yours truly…” me! Bill was working with another customer who was buying an annual pass, so I mentioned to the woman that when people don’t have the cash, they can put their credit card information on the self-pay envelope and deposit it into the self-pay locked box, or I told her that if she uses the park often perhaps she might want to purchase an annual pass. Well, that set her off like a cannon, and she threw her arms up in the air and shouted “oh no, you are not going to force me to buy your annual pass”. I said ” I’m not trying to force you to buy anything, I’m simply letting you know how you can use the park without paying in cash”. At that point she tossed her credit card on the counter and said “just process this ticket and let me get out of here”. I ran her credit card which failed to go through twice then I let her know her card failed to go through. She said “well I have another one and stormed out the door to her car. When she returned she literally threw the card at me and said just get this ticket paid and let me get out of here and I will never be back here again. She went on to say “I pay taxes and you still want to charge me to walk around in your park”. I tried to let her know that San Tan is a county park and is not supported by any tax dollars. All park fees go directly towards the upkeep and maintenance of the park. I also told her that most of the staff working in the park are volunteers. She said “well your volunteering your time for the wrong place” and out the door she went! What I wanted to say to that woman was ” I can see that you are having a really bad day, and we want our customers to come here to this park and enjoy the experience, and nature…, so I’m going to let this ticket be on me and I will take care of it for you because it just isn’t worth $6.00 to let this ruin your day or mine… so if you will just go out and try to spread a little joy into your surroundings instead of leaving here with all the anger, I will pay your ticket myself”. However, before I could get a word in edgewise, she stormed out shouting that she would never be back again. All I could get out was “I hope the rest of your day is wonderful”. Thank God it really is only 1% of the public that ever come in acting like that woman. When someone acts like that, it not only makes your day less fun, but I would think she had to have left there feeling miserable within herself… I can’t imagine anyone acting like that and feeling good about it… Just my thoughts.. The very next day Bill and I made a trip to Scottsdale to pick up our medications. While we were there we stopped off in Fountain Hills to pick up our mail, and have a quick visit with our dear friends Holly and Chuck. Chuck wasn’t there because he was working. Holly was working too, but she works from home and we made arrangements to arrive at her lunch hour so we could get a short visit in with her. Just before we had to leave to get back to San Tan, Holly surprised me with this adorable birdcage welcome sign she got me as a gift for our new winter home outside space when we get back to McDowell Mountain Regional Park in Fountain Hills. 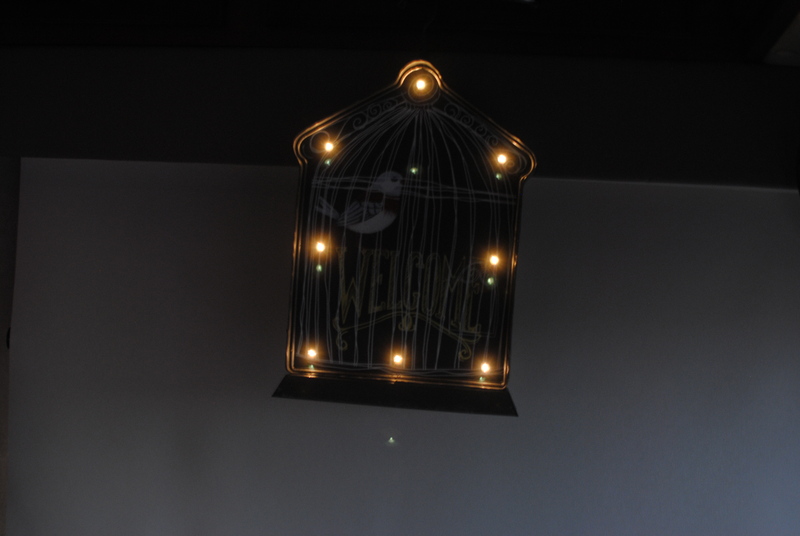 And check this out… it lights up! How cute is that! Thank you Holly. I just love it, it makes me smile every time I look at it…, and I love you too! And speaking of things that make me smile, we got the word from the East Side County Parks Superintendent that we are needed back at McDowell Mountain Regional Park in Fountain Hills. They are gearing up for their busy season… So, the Superintendent told the Supervisor here at San Tan that he needs to be ready to let us return to McDowell Mountain Regional Park by the end of October! We were happy to come here to San Tan and help out while we could. But now we are anxious to get back to McDowell Mountain Regional Park, get settled in, and get our outside living space fixed up there, because that will be our winter home going forward. I LOVE the holiday’s, but Halloween has never been my favorite holiday. 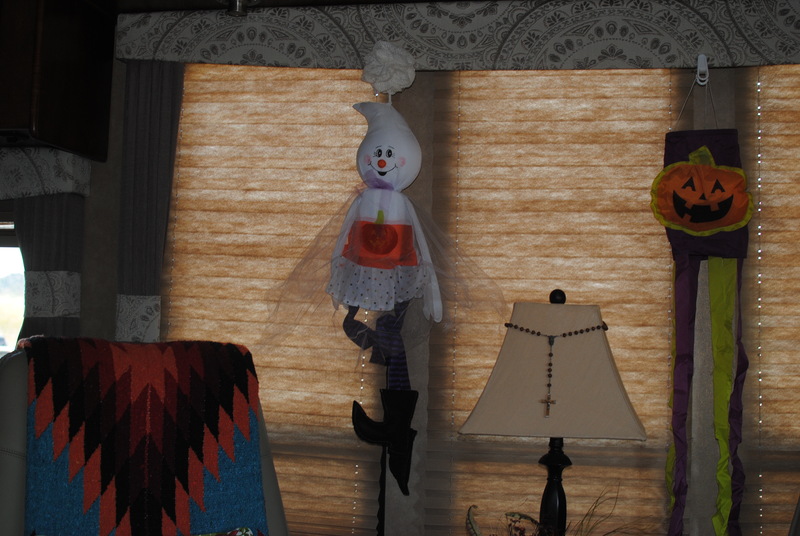 I’m not even sure Halloween is really a holiday to begin with… But just in case it is… and because I always decorate for the holiday’s…, I thought I should at least give a nod to Halloween in my home decor…I’m not a Halloween hater… It’s just not my favorite day of recognition…. However, I did purchase these cute little Halloween decorations. A witch ghost, I liked her purple and black stripped stockings and witch boots, and a pumpkin wind sock, I liked the purple and lime green streamers. I decided to hang them in my living space because when you live in a tiny home,with limited tabletop spaces, you look for ways to decorate up! 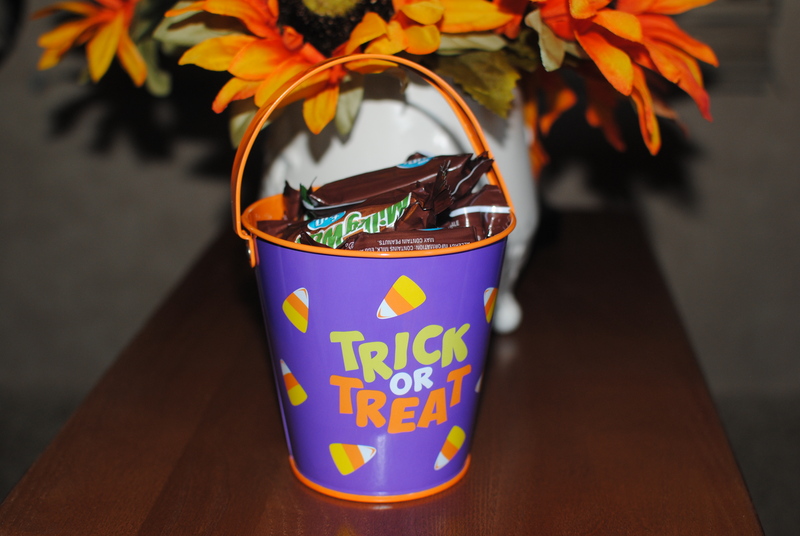 I also found this cute little Halloween bucket. 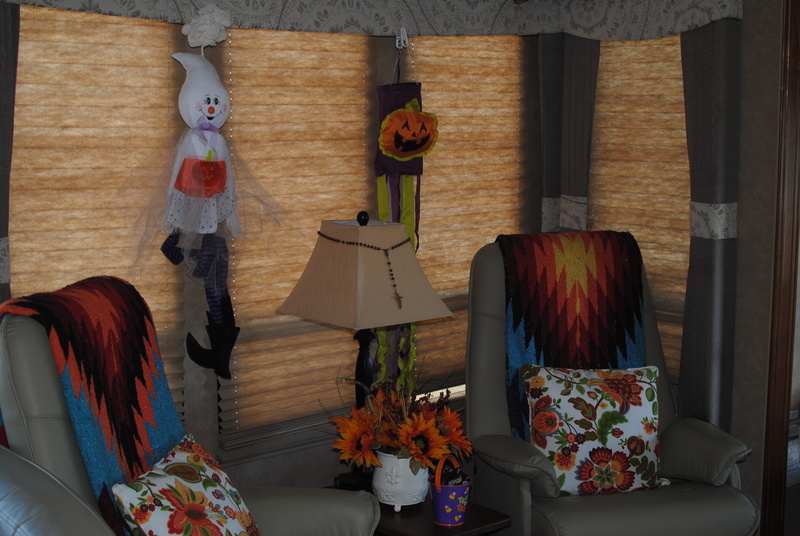 I liked the colors and the candy corn decorations. I filled it with mini MilkyWay bars and sat it in front of my fall flower arrangement to welcome guests when they come to our home. Sweet don’t you think? If you love Halloween I hope you are enjoying decorating your space, and that you have the best Halloween ever! ** I want to take a moment here to thank everyone that took the time to share your condolences for the passing of our precious cat Carmen this past week. Your kind words made a very difficult time a little easier. Now that I’ve taken the time I needed to process the loss, I’m ready to move on.